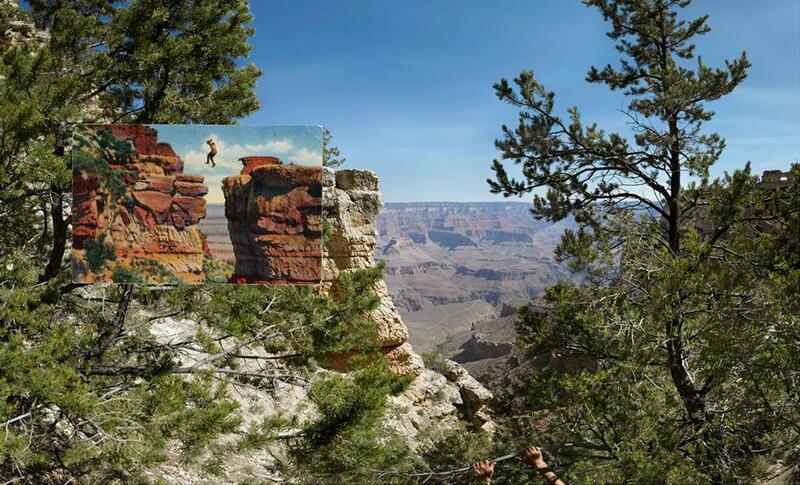 Mark Klett and Byron Wolfe: Grand Canyon Images Then and Now (PHOTOS). Two boys with striped shirts, Bright Angel Point, 2010. Inset: Postcard, photographer unknown, no date. Mark Klett and Byron Wolfe/Lisa Sette Gallery/Etherton Gallery. Photographers Mark Klett and Byron Wolfe are fascinated by time’s imprint on natural wonders. In Reconstructing the View: The Grand Canyon Photographs of Mark Klett and Byron Wolfe, published in October by University of California Press, the duo spent five years focusing on past and present images of the Grand Canyon to create a whimsical view of one of America’s most popular attractions. Arthur Wesley Dow, on the edge at Hopi Point, photographed by Alvin Langdon Coburn in 1911, 2010. Right image: Arthur Wesley Dow at Grand Canyon, Alvin Langdon Coburn, 1911 (Courtesy George Eastman House). Details from the view at Point Sublime on the north rim of the Grand Canyon, based on the panoramic drawing by William Holmes (1882), 2007. Sheets XV, XVI, XVII of Panorama of Point Sublime, William Henry Holmes, 1882; from Atlas to Accompany the Monograph on the Tertiary History of the Grand Cañon District by Clarence Dutton (Courtesy Library of Congress). Viewing the spectacle; the Sinking Ship on the South Rim with Buffalo Bill making a toast, 2009. Top insets (viewing figures): Selections from half of stereo views, photographers unknown (Courtesy Keystone-Mast Collection, California Museum of Photography, Riverside). Bottom left inset: Buffalo Bill and Party at Point Sublime, Grand Cañon of the Colorado, photographer unknown, 1893. Half-tone print from Pioneer America (artist’s collection). Bottom right inset: chromolithograph postcard, Arizona, Grand Canyon of Arizona, William Henry Jackson/Detroit Publishing Company, 1898 (Courtesy Brigham Young University). In the book, Klett and Wolfe take a playful look at rephotography—a tool used in scientific research as a means of tracking elemental change in the environment by taking photographs from the same precise locations over time. Instead of presenting older and newer images as a continuum to show evidence of change, the duo place the historical image directly over their new photograph of the old location, thereby hiding the very information rephotography would normally provide. By doing this, they also create an entirely new landscape, one in which a window into the past has been opened and time passing can be seen as only part of the story. It seems natural that their work would converge this way, since both photographers have a background in science (Klett in geology and Wolfe in biology and anthropology). They met when Wolfe was one of Klett’s grad students in photography. Once they picked the Grand Canyon as a subject, they began the massive undertaking of choosing locations; hording source imagery they found online, in museums, and in antique stores; and eventually coming up with the best intersections between the various old and new materials. Klett and Wolfe have developed a sort of visual encyclopedia of a place, with no rule as to how comprehensive it must be nor how few or many manners of representation are acceptable. 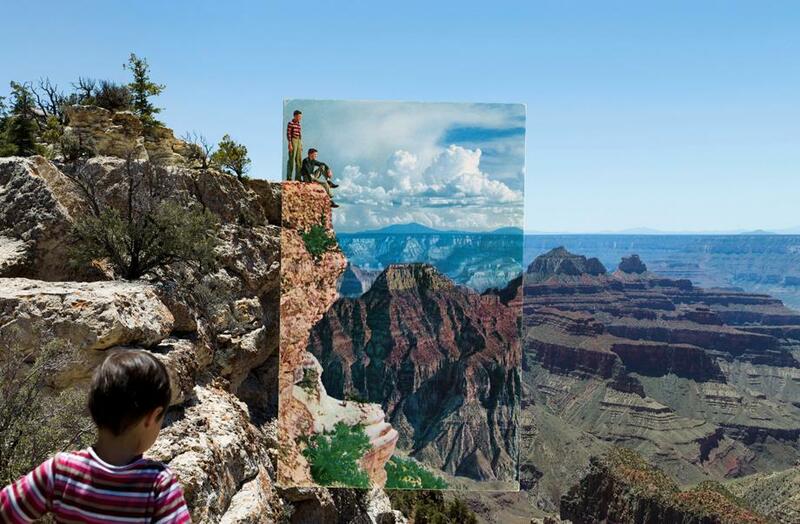 In the end, their method of image combination leaves the viewer with the impression that time and space—at least at the Grand Canyon—isn’t finite. Overlooking rafters on the Colorado River. Above Marble Canyon near Lee’s Ferry, Arizona, 2010. Overlay: Grand Canyon, Colorado River, William Bell, 1872 (Courtesy National Archives). 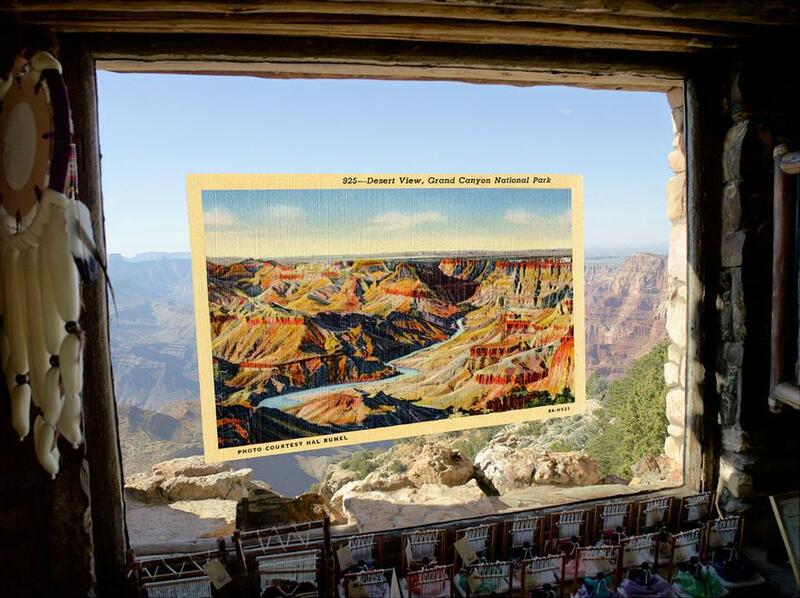 Reconstructing the view from the El Tovar to Yavapai Point using nineteen postcards, 2008. At the canyon’s edge: figures on “The Devil’s Anvil” overhang, 3000 feet above the Colorado River, 2010. Back: Figures on the Devil’s Anvil, 2010. Overlay: Devil’s Anvil, Sheavwitz Crossing Near Foot of Toroweap Valley, River 3000 Feet Below, Colorado River, William Bell, 1872l (Courtesy National Archives). One hundred and five years of photographs and seventeen million years of landscapes; Panorama from Yavapai Point on the Grand Canyon connecting photographs by Ansel Adams, Alvin Langdon Coburn, and the Detroit Publishing Company, 2007. Left (two views): Grand Canyon National Park, Arizona, Ansel Adams, 1941 (Courtesy the Center for Creative Photography). Middle view: Bright Angel Canyon, Alvin Langdon Coburn, ca. 1911 (Courtesy George Eastman House). Right: The Grand Canyon of Arizona Across from O’Neil Point, Detroit Publishing Company, 1902 (Courtesy Library of Congress). Site of a dangerous leap, now overgrown, 2008. Inset: Colored postcard, no date. Desert View: from the window of the Watchtower gift shop, 2008.